Author: Michaela Oberhofer. Series edited by: Thomas Bierschenk, Anna-Maria Brandstetter, Raimund Kastenholz, Matthias Krings, Carola Lentz. 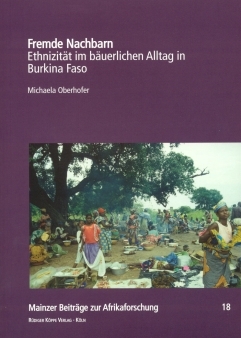 The present empirical study deals with the prevailing peaceful social life of the ethnic and linguistic heterogeneous population of Northwest Burkina Faso. Their communal life is on the one hand characterized by ethnically extravagating memberships and similarities, but on the other hand marked by conflicts and separation processes. The different peoples – amongst them Jaana, Phuo and Lobi – share numerous cultural, political, economical, and religious parallels. Their ancestors have migrated in the 18th and 19th century from northern Ghana to their actual settlement area. Because of the shared migration experiences as well as the long lasting social cohesion, and despite linguistic boundaries the people are affiliated to each other via banter relations, marriages, regional spread rituals or village societies. Additionally, many of the kinship groups exhibit foreign or external origins, which is still remembered by the community members. This research constitutes an important contribution to the current debate on ethnicity, because it does not focus – like most works on this issue – on political dimensions of ethnicity, but on ethnicity in every day life of farmers. To give consideration to the diverse negotiation processes of inter-ethnic relations, a differentiated perception of ethnicity and ethnic boundaries is required. Historical and ritual differences in meaning of ethnic membership have to be recognized, and ritual complementarity has to be realized as a basic principle of inter-ethnic relations. Analyses of different fields of action (birthright citizenship, kinship, neighbourhood, rituals) including ethnicity and other identification patterns respectively, display that the discourse level has to be separated from the practice level of inter-ethnic relations. Ethnic identification patterns play a more important role in personal relations (interactions between individuals) then in categorical relations (interactions between groups).